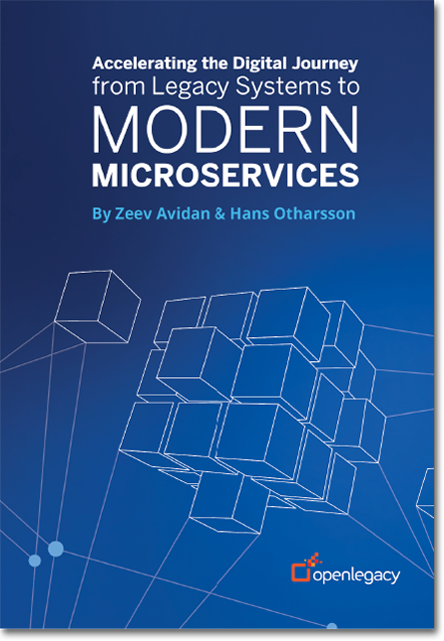 This fully illustrated eBook promises answers and insights regarding today's microservices and legacy system APIs. It's ideal for any IT department considering a microservices architecture and also helps business executives understand how microservices can help speed the delivery of digital innovations for mobile, the web or cloud. As many aspects of our lives become increasingly digital, there is a need and expectation for our financial to be digital too. As of June 2016, 46% of the world’s population uses the internet. Mobile device use now surpasses desktop use. Digital consumers need to interact with banks and financial services online – with mobility and security. Disruptors have successfully made necessary changes and offered methods that adapted to customers’ habits and legacy organizations that have done a digital transformation have not only been successful but they are taking the lion’s share of customers – especially those of tech savvy Generations X and Y. 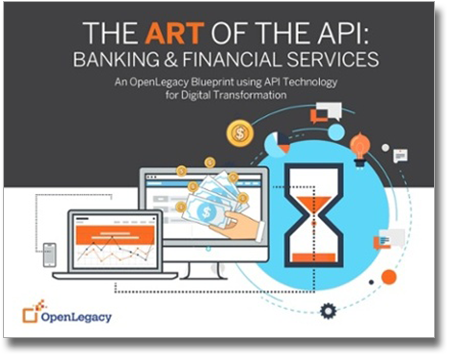 This ebook serves as a blueprint to implement APIs (application programming interfaces) for the large banking and financial services enterprises who need to speed up their digital transformation or face serious competition from the newer, nimble start-ups. Customers expect real-time information whenever and wherever they are, without the assistance of an agent or a call center representative. The modern agent requires new tools and applications to maintain productivity in a mobile environment. 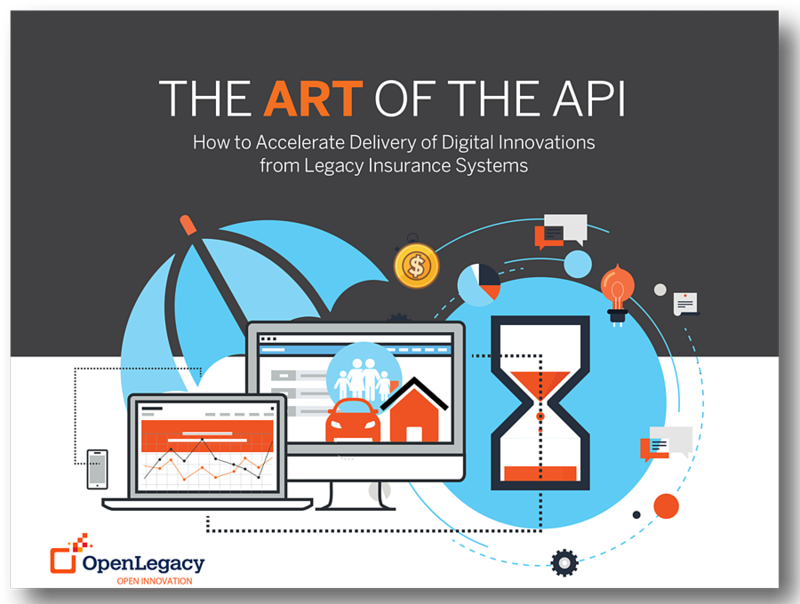 This eBook explores the topic of using APIs (application programming interface) to quickly deliver the innovations that insurance customers demand. Typical large enterprises have hundreds – maybe thousands – of applications that were built in-­‐house or bought from a third party vendor. They run alongside each other and sometimes interact, but only with much planning and work beforehand. 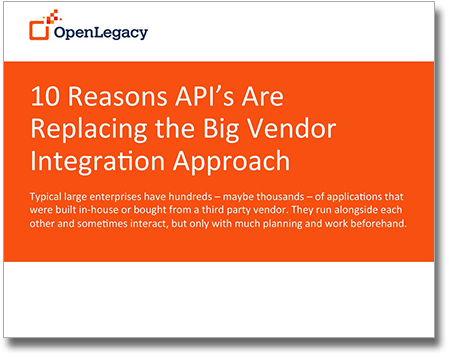 This eBook explains the top ten reasons why APIs are increasingly popular when compared to a traditional integration approach. 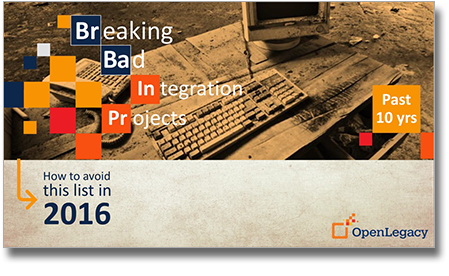 Large IT Modernization projects often fail, and are over budget, behind schedule and haven't met performance expectations. This eBook explores the recent history of legacy modernization contrasted against the newer approach using API integration and management.